The pro races at the Drake Relays take center stage today. This is the best week of the year for a track and field and road running fan. It started with the Boston Marathon, continues today with the Penn Relays and Drake Relays, and winds up on Sunday with the London Marathon. Tonight is “Hy-Vee Night at the Drake Relays”, with several first-class “Beijing Preview” professional races plus the first events in the Hy-Vee Cup collegiate scoring competition, the university men’s and women’s 4×800 relays. These events will be carried LIVE on Universal Sports TV and USATF.tv from 8:00 to 9:30pm Eastern time. Monday was the Boston Marathon. Tuesday was the Grand Blue Mile. Wednesday was the Vault on Court Avenue, a street vault in downtown Des Moines held in conjunction with the Drake Relays. Yesterday was the first day of full competition at the Penn Relays and Drake Relays. The highlights were an upset win by Villanova in the Penn Relays women’s distance medley, and a record-setting run by Oklahoma State in the Drake Relays women’s 4×1600 relay. The two big relay meets, the Penn Relays and Drake Relays, take it up another notch today with even more and better action. You can see the rest of the day’s action live online but you’ll have to pony up a few dollars to see it. Here is a handy combined schedule of the two meets, so you know which feed to watch and when. 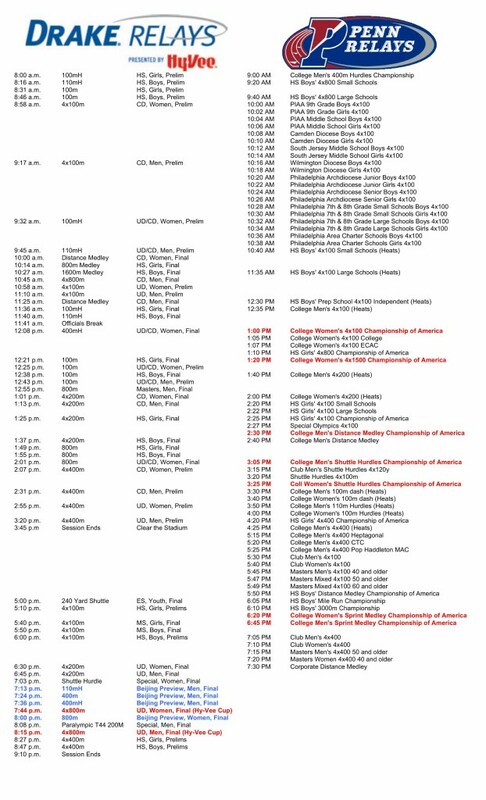 Note that the Drake Relays are in the Central time zone and the Penn Relays are in the Eastern time zone, which is why the listed times are different from each other by one hour. OK, you know there’s action going on all day, for thirteens straight hours. It’s all great stuff, but you may have to prioritize. Here are the ten best events to watch today, listed in chronological order. The USTFCCCA’s “Sparknotes” on this race: the best women’s 4×100 team in the nation has won this race at Penn every year in the Obama administration. Oregon and LSU didn’t make it through the heats, leaving this as a battle between Texas (winners at their own Texas Relays), Texas A&M (six-time defending champions), and the outsiders, Jamaica’s University of Technology. In a shocking upset, Villanova’s Stephanie Schappert blew by Stanford superfrosh Elise Cranny yesterday to win the women’s distance medley. The two teams will again go head-to-head, and presumably the same two runners on the anchor legs. Georgetown could be a factor as well. This is often the most interesting race of the whole weekend. It’s certainly true that the distance medley is unpredictable. Oregon and Villanova are the teams expected to battle it out. Word is that Oregon will not run Edward Cheserek and instead rely on Eric Jenkins (NCAA indoor 3k/5k champ) on the anchor, plus any of a number of sub-4:00 milers for the 1200 leg. At the NCAA indoor championships, the Ducks got the baton to their anchor leg with a massive lead over Villanova and that pretty much sealed the deal. If that happens again, the race is over–but the Wildcats know that and coach Marcus O’Sullivan will figure out a way to keep it from happening. I tend not to cover high school track and field because I think it’s a sport best appreciated on a local level, but the Penn Relays is a bit different, especially in the 4×400 relay. Here it’s a friendly but intense rivalry between Jamaican and American teams. Today it’s four of each, but it’s been six years since a US team won. This is a Diamond-League level field of high jumpers. Last year, Derek Drouin (Nike/Canada) beat Erik Kynard (Nike) with a new national record of 2.40 meters (7′ 10.5″). They’re both back, and jumping against 2011 World Champion Jesse Williams (Nike/Oregon TC), outdoor world leader Zhang Guowei (China), Olympic medalist Robbie Grabarz (Great Britain), plus many other top jumpers. The culmination of the competition will be during the live coverage on Universal Sports TV and USATF.tv. Collegians Demi Payne (Stephen F. Austin) and Sandi Morris (Arkansas) will do battle again; they’ve totally rewritten the record books this year. They’ll go up against some of the best pros: Mary Saxer (New York AC), the USATF indoor runner-up (to Payne), Katerina Stefanidi (Nike/Greece), the European indoor runner-up, and more. 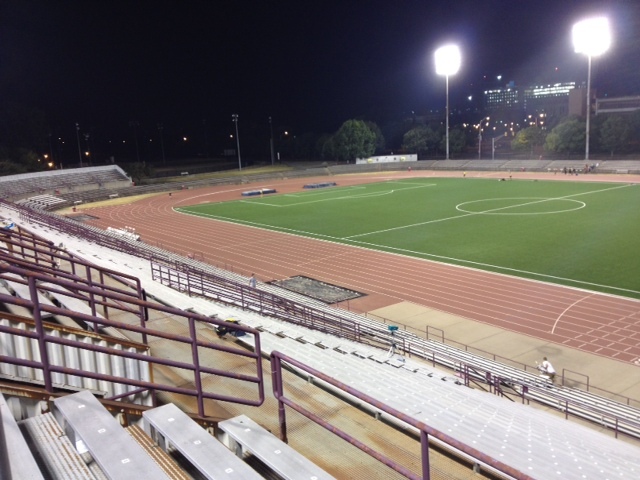 Live coverage on Universal Sports TV and USATF.tv begins at 8:00pm ET. This is another Diamond League-type field. The best hurdler of the indoor season was first-year pro Aleec Harris (adidas) and the best hurdler of last year was David Oliver (Nike). World record holder Aries Merritt (Nike) looks like he’s getting back into form after a long battle with hamstring problems. All eight entrants are legitimate stars, and any of them could win. LaShawn Merritt (Nike) vs Kirani James (Nike/Grenada). It’s one of the best rivalries in track and always a war. Michael Tinsley (adidas) and Javier Culson (adidas/Puerto Rico) were the world’s two best last year. They’ll be joined by first-year pro Roxroy Cato (Puma/Jamaica), who won the Penn Relays last year, plus veterans Bershawn Jackson and Kerron Clement. The USA suddenly has a deep group of women’s half-milers and they’re all here, making this more of a US Championships preview than a Worlds preview. Ajee Wilson (adidas) is head and shoulders above the rest, but Brenda Martinez (New Balance) is also one of the best in the world, and Alysia Montano (Asics/New York AC) and Chanelle Price (Nike) are on the comeback from pregnancy and injury. If you’re a true fan, you’re going to be phoning it in at work today while watching the action online. Here are some deeper previews. 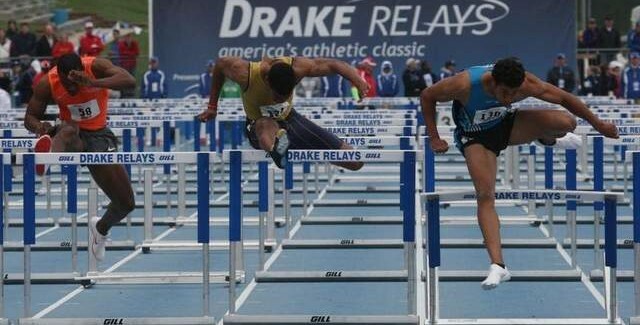 The Des Moines Register runs down all the Drake Relays high school action.